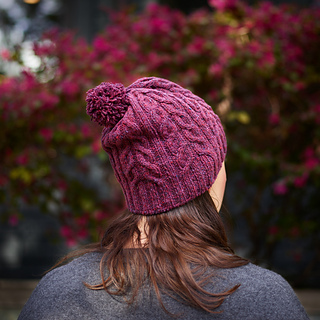 Adult S/M (M/L); circumference 18 (21)” / 46 (53) cm; height 8.25” / 22 cm for beanie; 9.75” / 25 cm for slouch (height is adjustable). Wildwood Trail is available for free to subscribers of my e-mail newsletter. 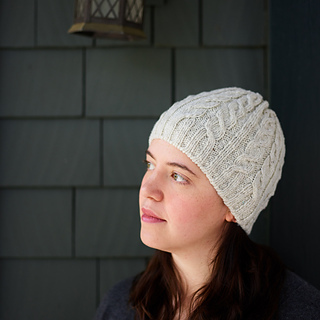 If you’re already a subscriber, you’ve received a code to download the pattern for free. 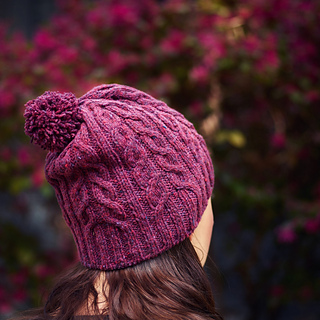 If you’re not, and you’d like to get the pattern for free, click here to subscribe, and you’ll receive the code to download the pattern for free in your confirmation e-mail. 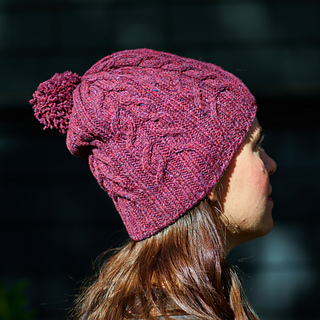 Pairs of filled two-step cables wind their way up this modern take on a classic cabled hat, available in two styles: a fitted, unisex beanie and a funky, more feminine slouch. 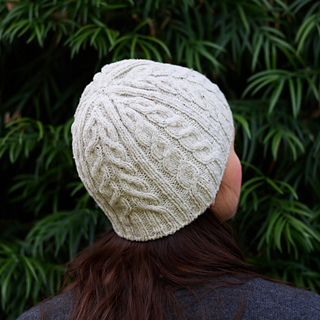 Brooklyn Tweed’s woolen-spun Shelter yarn keeps these cables light and open, while Shelter’s array of gently heathered colorways gives you a huge range of options. 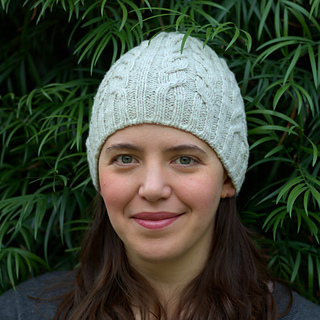 Choose a darker navy, green, or a neutral in the beanie option for a sophisticated, more masculine look, or a brighter, warmer shade in the slouch style for a younger, potentially “girlier” vibe. An optional tubular cast on provides a neat, elastic finished edge. 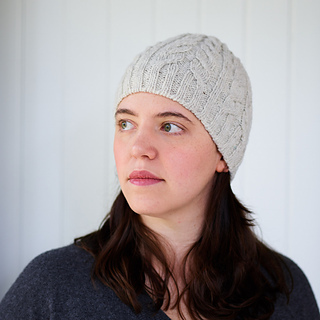 A doubled brim (not pictured) would add an additional set of possibilities—just double the length of the ribbing and follow either set of instructions thereafter. Brooklyn Tweed Shelter (100% Domestic Targhee-Columbia Wool, 140 yards / 128 meters per 50 grams), 1-2 (2) skeins. 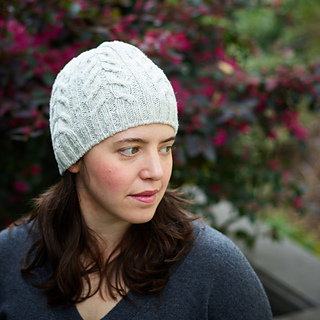 Samples knit in Fossil (beanie) and Homemade Jam (slouch). 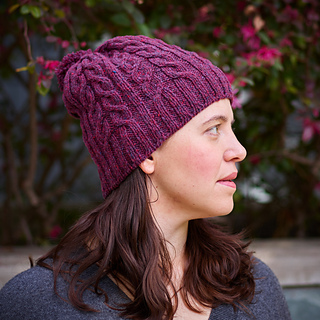 Note: the S/M size in the beanie just barely goes in one skein of Shelter. Check your yardages carefully if you’re using a partial or substituting another yarn. 27 sts and 32 rnds per 4” / 10 cm in cable pattern on larger needles, after blocking. One repeat of cable chart measures approximately 3” / 7.5 cm wide. One long (32” / 80 cm or longer) circular needle (for magic loop), or 5 double-pointed needles, per knitter preference, in sizes US 6 / 4.0 mm and US 3 / 3.25 mm or size needed to obtain gauge and three needle sizes smaller. Note: if you are doing the optional tubular cast on, you may wish to use a needle one size smaller than your ribbing needle for the foundation rows. Stitch markers (optional); tapestry needle; pom-pom maker (optional); cable needle (optional); waste yarn for tubular cast on (optional). Decreasing; knitting in the round; small-circumference circular knitting using double-pointed needles or magic loop; cabling with or without a cable needle; tubular cast on (optional).